....at the time and location of your choice! 1. Text oruuc to 73256. 2. In reply, you will receive a text that says “You’re almost there.” That message will have a link to a secure site for entering your payment. Click on that link. 4. Choose the fund you wish to contribute to from the dropdown list and hit the Give button. 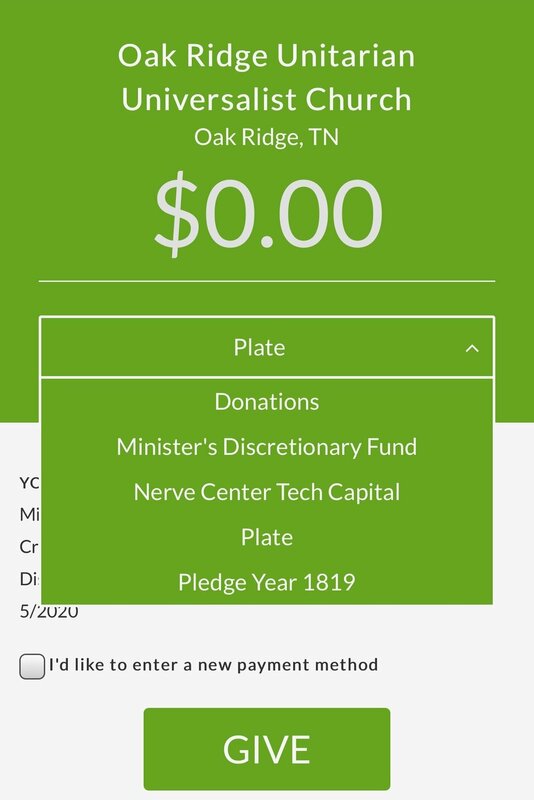 These include the Split-the-Plate Sunday offering, general Donations, the Minister’s Discretionary Fund, The Nerve Center Tech Upgrade, and your normal Pledge for the current fiscal year. 5. If this is your first time to donate by text-to-give, you will be prompted to enter your payment method. The method will be remembered for subsequent visits to the site, but you can change the payment whenever you wish by checking the “I’d like to enter a new payment method” box. 6. You'll receive a quick confirmation of your successful donation. It's that easy!